This Dairy-Free Pimento Cheese is a new take on an old classic. 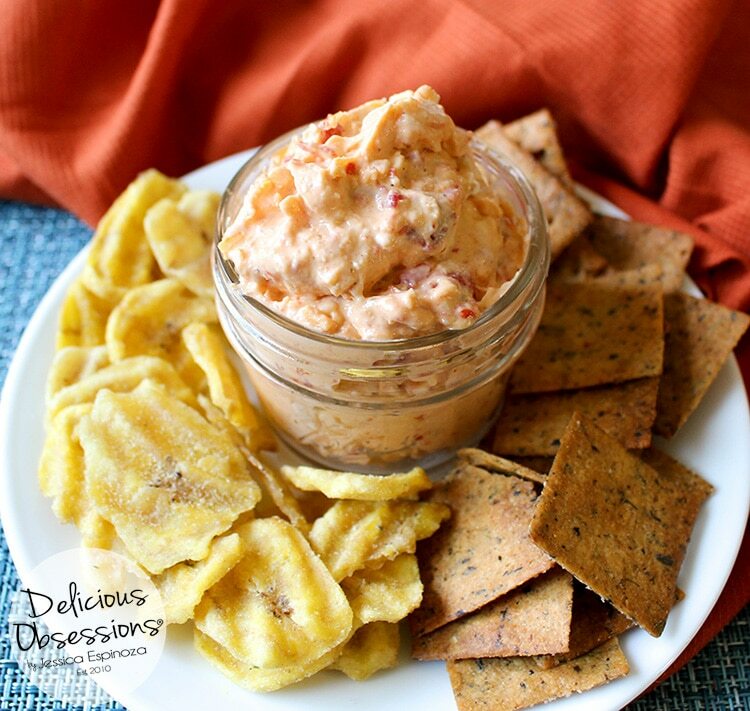 If you’re sensitive to dairy, but missing pimento cheese spread, this recipe is for you. This versatile dairy-free pimento cheese can be used on sandwiches, wraps, chips, crackers, or veggies. Plus, it’s easy to make! OK, pimento cheese is not something I ever expected to share on this site. It’s not a dish that has played a big role in my life, although my mom used to make some pretty killer pimento cheese when I was growing up. Alright, that seems doable. There are some pretty amazing dairy-free cheese substitutes out there, so I headed to the kitchen and started experimenting. I’m not going to lie. I had some MAJOR flops when I was creating this recipe. For a while there, I really thought I wasn’t going to be able to create a version that had the right taste or texture. But then, magic happened and the perfect proportions hit my food processor. Out came dairy-free pimento cheese perfection. Y’all know how I like food history. I am often curious about where certain dishes originated and I always Google things to see what new factoids I can learn. Pimento cheese was no different. To be honest, I had no idea where pimento cheese came from or if it even had a history. Who am I kidding? All food has a history of some sort. Even if it’s just something our great grandma whipped up one night on accident. Turns out pimento cheese is considered a Southern thing. I had a “duh” moment when I read that. No wonder my Mom used to make it. My whole family is from the South. BUT, like the fried green tomato history I shared in this post, pimento cheese didn’t actually start in the South. Pimento Cheese is Not From the South! …back in the 1870s New York farmers started making a soft, unripened cheese that eventually evolved into cream cheese. Around the same time, Spain started sending canned red peppers or “pimiento” over to the United States. They soon caught on, minus the extra “i”, and became a staple of many kitchens across the country. After that, the pimento cheese craze started and there was a cascade of similar recipes that started appearing in cookbooks and magazines around the time of World War I. 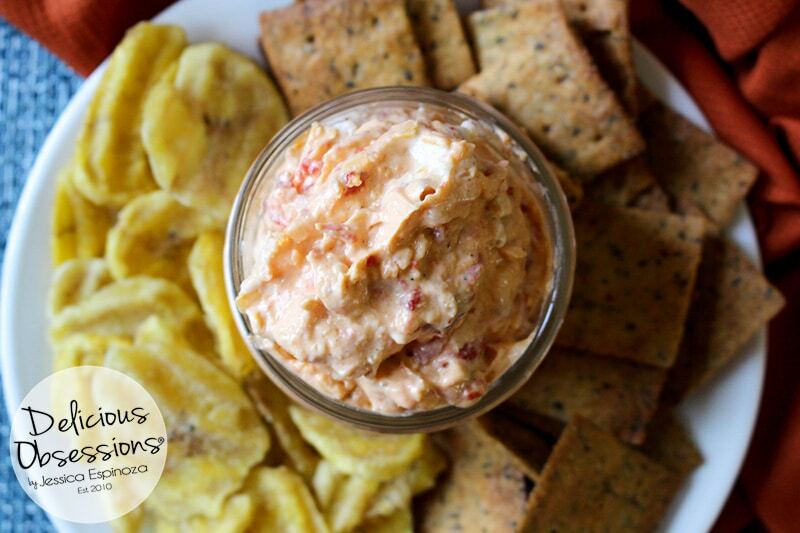 While it turns out that the South may not have invented the delicacy we all know as pimento cheese, it did play a big role in the continuation of the recipe. Around 1911, it was quite expensive to import pimentos from Spain. They were an in-demand delicacy, but the cost was prohibitive. Southern farmers saw an opportunity and affiliated with the Georgia Experiment Station outside of Griffin, Georgia, where they soon began cultivating domestic pimentos. This is just a brief history of pimento cheese. You can read even more about it over on the Serious Eats site here. Who knew that a cheese spread that has become so common today had such an interesting history? OK, interesting to me. Not sure who else cares about the history of food like I do. LOL! I am really proud of this dairy-free pimento cheese recipe. It’s not often that I can recreate dairy-free recipes that taste as good as their dairy-filled counterparts, but I think I got pretty darn close with this one. 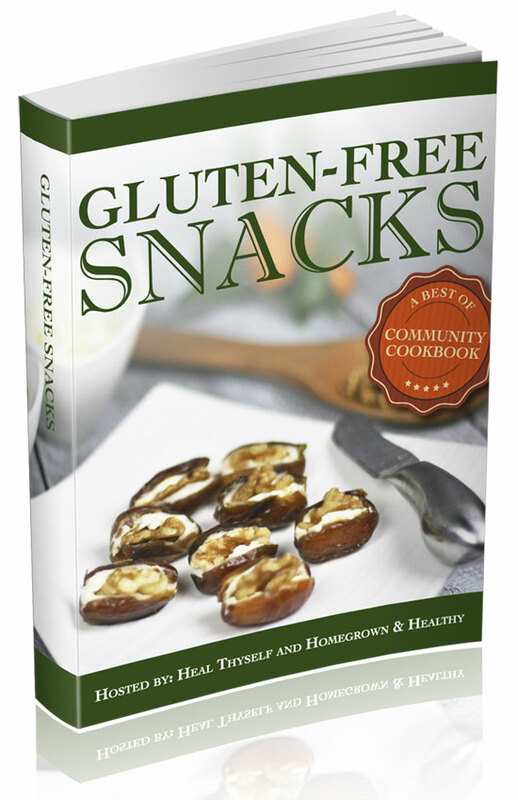 While developing this recipe, I played around with different brands of dairy-free ingredients. There are some really impressive dairy-free cheese substitutes out there. It’s amazing how far the dairy-free cheese niche has come since I first went dairy-free back in 2012. 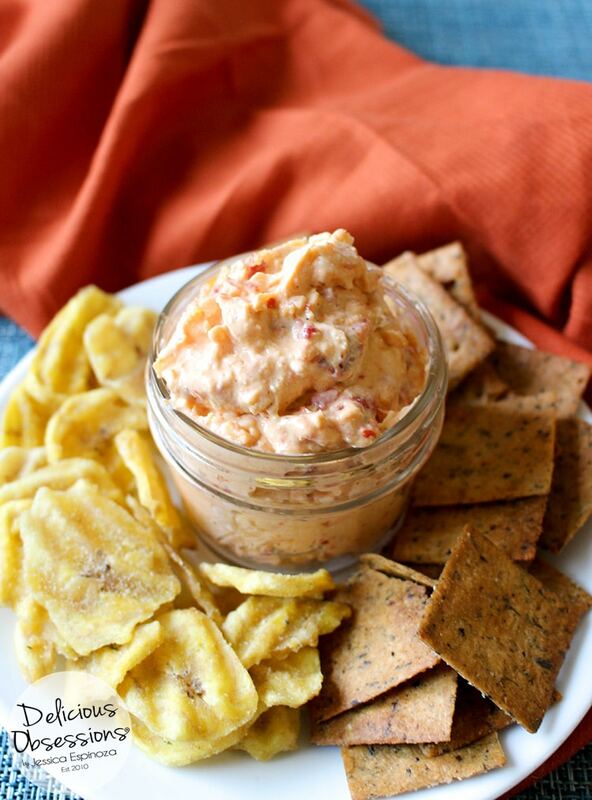 Like I mentioned above, I had some major flops while creating this dairy-free pimento cheese recipe. The ingredients I list in the recipe below are the ones that gave me the absolute best taste and texture for this recipe. You’re welcome to use other brands but I can’t guarantee taste or texture. Everything I used should be available nationwide in the States. I know Sprouts, Natural Grocers, Whole Foods, and Kroger all carry these brands here in Denver. 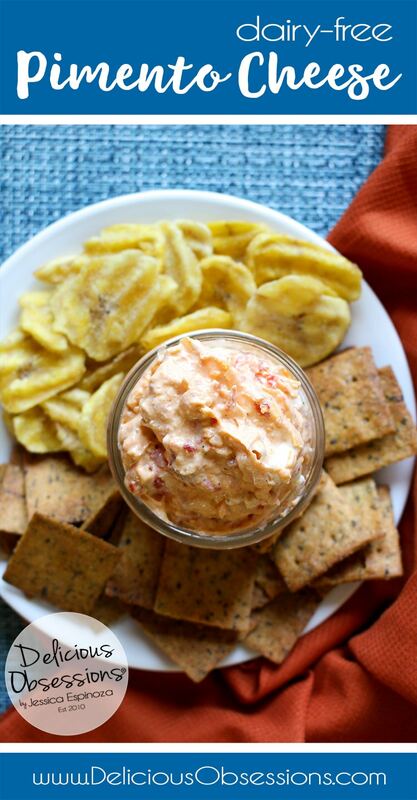 To enjoy this dairy-free pimento cheese, slather some of it on your favorite homemade crackers or chips like these Grain-Free Herb Crackers or these Plantain Chips. If you don’t feel like making your own crackers, I love the Simple Mills brand, Jilz Crackers brand, or Mary’s Gone Crackers brand (all can be found on Amazon via those links or at most local grocery stores). It also tastes great on sandwiches and wraps. Or, if you’re skipping the crackers, bread, and tortillas, try veggies! Celery and cucumber slices are my personal favorites. Regardless of what you decide to use, I really hope you enjoy this dairy-free pimento cheese as much as I do. This recipe totally soothed that craving and I’m excited to know that pimento cheese is still an option for me, even being dairy-free! Note: It is helpful to make sure all of your ingredients are chilled in order to get the right consistency. Drain your pimento or piquillo peppers well (you may even use a towel to dry them off slightly). You don't want any excess moisture in this mixture as it will make the cheese dip soupy. In the bowl of your food processor, place all the ingredients and pulse until blended. You can play around with the texture. Some people like a smooth pimento cheese, while others like it slightly chunky (like me). Place in an airtight container and store in the fridge for up to 5 days. Serve with sliced vegetables (celery, carrots, cucumbers, and peppers are all nice), or any cracker or chip of your choice (check out the cracker and chip recipes I linked to in the blog post above). If you need a quick option for crackers, I linked to some of my faves up above as well.